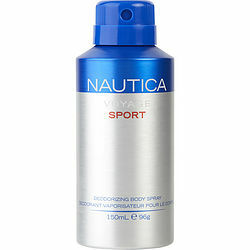 Nautica Voyage Sport by Nautica lets men show their spirit of adventure. Created in 2016, this hardy scent is perfect for men who have a sense of daring. To achieve its fresh, robust fragrance, marine and sea salt top notes lead into apple and geranium heart notes, finishing with a flourish of base notes including Brazilian redwood. Destined to be a classic, this cool scent evokes memories of journeys on the high seas. Wear it the next time you run errands around town or take a trip around the world.